We've got a new surfboard stand on StoreYourBoard (in addition to our other surfboard stands) that provides another great option for storing and displaying your surfboard in your apartment, house, garage, shed, deck - or wherever you store your board. The stand is a premium option with a nice wood finish that looks great. And it does not require any mounting, so it is apartment/rental property friendly. What's unique about this surf stand is the way it secures your board. Some stands secure your surfboard upright by clamping the center fin to keep the board in place. 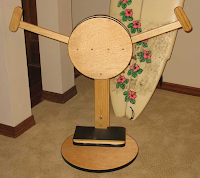 This stand uses rotating arms that move automatically to lock your board in place. The arms rest in an open and unlocked position. 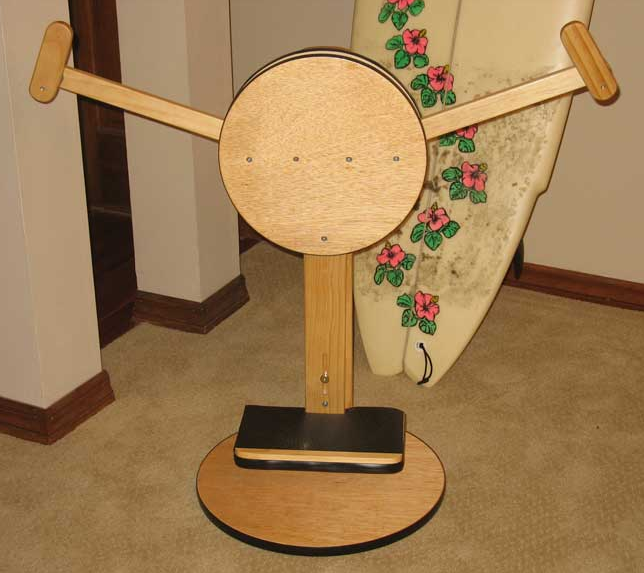 But the base of this surfboard stand is designed so that when weight is applied to the base (when you rack your surfboard), the arms automatically rotate inward to clamp your board in place. Lift the board up off the base and the arms then open up again, allowing you to easily remove your surfboard from the surf rack. The limit on width of boards is 30", which means this stand can also hold wakeboards, snowboards, and more! Check out the video below!